Gurudwara Sri Paonta Sahib : Surrounded by the Sal forest and on the bank of river Yamuna the historic town of Paonta Sahib was founded by the tenth Sikh Guru Govind Singh Ji. When only sixteen years old, the guru left Anandpur Sahib and on the invitation of Raja Maidini Prakash of Sirmour, lived at this beautiful place for over four years. The historic gurudwara commemorates his stay and interestingly the waters of the Yamuna fall silently below this -which happened at the Guru's behest. Paonta Sahib recalls Guru Govind Singh's presence even in the name of the city which is derived from "paon" meaning "foot" either because he set foot in this place or according to an alternative story, because he lost an ornament which he wore on his foot called a "paonta" while bathing in the river Yamuna which flows here. Paonta Sahib was Guru Gobind Singh's home for over four years and it was here that he wrote the Dasam Granth. Within its precincts are the Sri Talab Asthan where he disbursed salaries and the Sri Dastar Asthan were he judged the turban tying competitions. At the Kavi Darbar Asthan, poetic symposia were held. 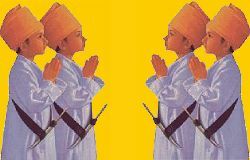 There is also a memorial to sage Kalpi and a museum that displays pens and weapons of the period among other artefacts. 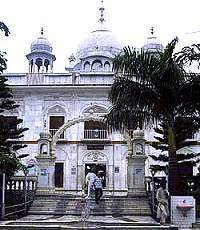 Gurudwara Tirgarh Sahib : This is built on the hillock from where Guru Gobind Singh shot arrows at the enemy. Gurudwara Bhangani Sahib : This commemorates Guru Gobind Singh's first battle when he defeated Raja Fateh Sahib and his allies..
Gurudwara Shergarh Sahib : At this spot Guru Gobind Singh beheaded a dangerous man eater tiger with a single swipe of this sword. Day 1. Early morning drive for Paonta Sahib, reach Gurudwara Paonta Sahib in the afternoon, Darshan of Paonta Sahib Gurudwara, Museum and around, night at Paonta Sahib hotel. Day 2. Breakfast, morning drive for Darshan of Gurudwara Tirgarh Sahib, Gurudwara Bhangani Sahib, Gurudwara Shergarh Sahib, afternoon drive back to Delhi, reach Delhi late evening. For 2 Persons : Rs 5500 Per Person on Double/Twin sharing Room. For 4 Persons : Rs 4500 Per Person on Double/Twin sharing Room. For 6 Persons : Rs 3900 Per Person on Double/Twin sharing Room. For 8 Persons : Rs 3600 Per Person on Double/Twin sharing Room. - AC Car/Coach from Delhi till end of tour. - Air Conditioned Hotel Accommodation. * Delhi Paonta Sahib and Manikaran Sahib 3 Nights/4 days Tour.